We are confident we will create the backyard design of your dreams for your Cornelius home. Parents are realizing that engaging the entire family can take a bit of effort these days. Pulling the kids away from video games and other electronics is challenging, but you could pull it off more easily with the backyard design that affords them another type of fun. Here at Chad Goodin Signature Homes, we can put together a backyard that will be everything you and your family want while increasing the value of your home. Our pool design and installation will provide not just fun for your family, but also the therapeutic value that swimming affords. Swimming beats hanging out on the couch for hours and is perfect for entertaining, as well. Put in an outdoor kitchen and spacious patio, and having people over gets even easier. You’ll be enjoying your backyard design every bit as much as your children are. Our professionals can work to make your vision a reality or help you create a backyard design from scratch that will effectively meet your needs. 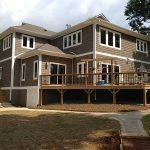 From the conception to the completion of your backyard design, your expectations will be exceeded, so you can enjoy both the process and the results. Whether you want just a few personal touches to your current backyard design or a complete makeover, you can count on us to make it a reality at your Cornelius, North Carolina home. Our strongest traits are our attention to detail and exemplary customer service. We are confident that these make your journey to the backyard design of your dreams a pleasant one, and your new oasis will be fun for you and your family. Contact us today to get started. At Chad Goodin Signature Homes, we provide high-quality backyard design services in Mooresville, Cornelius, Davidson, Huntersville and the surrounding Lake Norman area of North Carolina.